Affinity Designer for PC is the fastest, smoothest, most precise vector graphic design software available. Whether you’re working on branding, concept art, print projects, icons, UI, UX, or web mock ups, Affinity Designer will revolutionise how you work, on macOS and Windows. Imagined by designers, created for professionals! All the tools you need in a professional vector design app, from an incredible precise pen tool to a super smooth gradient tool. All carefully considered and meticulously developed, they just work—in precisely the way you want them to. 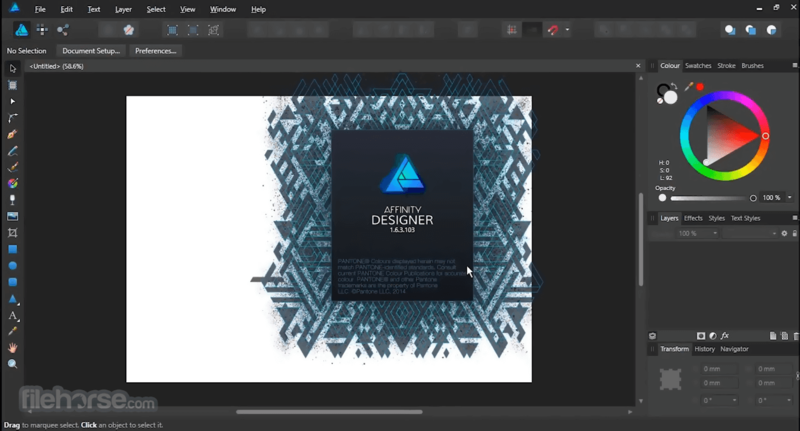 With core principles of performance, stability and lack of bloat, Affinity Designer has been meticulously crafted for a professional workflow. With real-time pixel preview in standard or retina resolution available with a single click, you can always see what you’re going to get. Can’t achieve the perfect result purely in vector? Just edit the pixels — Affinity Designer has a full suite of raster tools too. With a huge library of adjustment layers, effects and blend modes—combined with full support for masks and clipping layers—Affinity Designer offers the most advanced layer controls available in any vector based app. 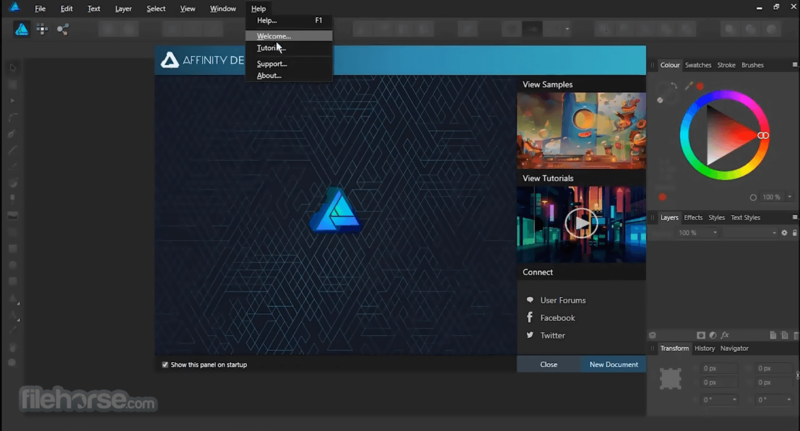 With a focused, fully customisable workspace, including docked and floating UI modes, Affinity Designer lets you work how you want. Add regular and custom 2D and isometric grids for flexible layouts, work on multiple designs at once, and use Windows features like Split Screen and Full Screen. Plus, with savable history, unlimited undo and non-destructive filters and adjustments you can always go back and change your mind. Use Force Touch, stylus pressure, tilt and other controls for natural-looking artwork. Edit vector brush strokes as cleanly and easily as regular curves, and add raster brushwork—on its own or with vector art—to add depth and high quality organic textures. Rotate the canvas, blend colors, edit brush parameters, create your own brushes and nozzles, and import .abr brushes for complete control over your work. Affinity Designer delivers a comprehensive set of shape primitives with easy controls for adjusting geometry with corner settings and smart snapping indicators. A full set of Boolean geometry operations, non-destructive compound shapes, and full node editing means you can create beautiful complex geometry in no time. Add artistic text for headlines, text frames of any shape, or text that follows any vector path. Apply sophisticated styling and ligatures, previewing all your available fonts and style sets in on-screen panels. All the controls you need are built in, including leading, kerning, baseline shift, tab stops – and now in version 1.5 you can create text styles across your document. Affinity Designer features full professional print output. Pantone® support, end-to-end CMYK and ICC color management are just part of it. 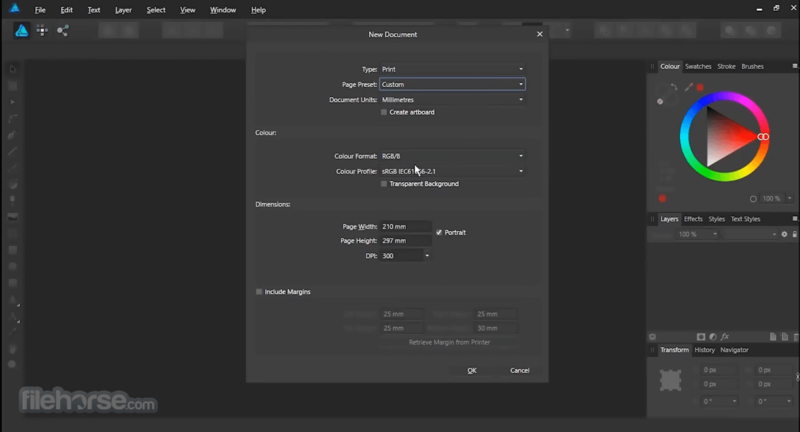 You can also open, edit and output PDF/X files, set overprint controls, use spot colors, and add bleed area, trim and crop marks. In export mode you get a complete workspace dedicated to image export. Select areas, layers or objects to export, controlling each item’s output settings independently. For efficient web and UI design, you can automatically create new files whenever your design changes, in whatever resolution, file format and folder structure you wish. Affinity’s shared file format makes mixed discipline design as smooth and simple as it should be. Open any native Affinity file in any Affinity app on any platform and just keep working – with shared history, unlimited undo and seamless switching. And for export, Affinity Designer for PC download takes all major file types in its stride. In Affinity Designer you can create an unlimited number of different design variants, sizes and screens – laying them out in one document to see them all at once. When you come to export you get full control over what artboards to output and with what settings, dramatically simplifying your workflow for responsive and app design. Note: 10 days trial version.